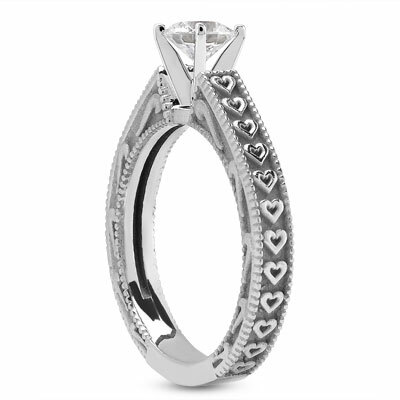 Celebrate your overflowing affection with this 1/2 carat engraved hearts diamond engagement ring in 14K white gold! A row of tiny carved hearts embellishes the outer surface of this sweet and sophisticated piece; these emblems of love are framed elegantly by milgrain edges. 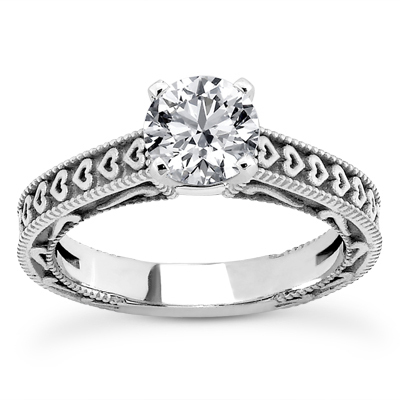 Simple swirls adorn the sides of this 14K white gold ring, while a half carat round diamond overlooks it from a four-prong setting and provides colorless dazzle. This is a lasting symbol of the love that fills your heart. A 0.50 carat engraved hearts engagement ring in 14K white gold. Apples of Gold Jewelry guarantees the 1/2 Carat Engraved Hearts Diamond Engagement Ring to be of high quality and an authentic engagement ring with real diamonds, as described above.